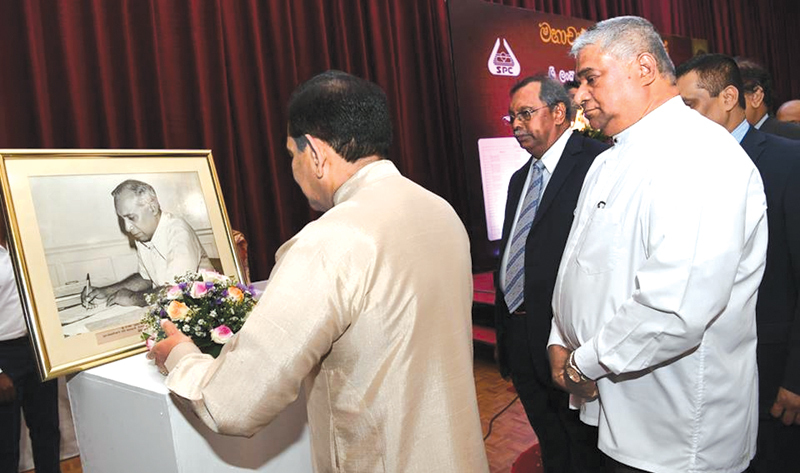 Health Minister Dr. Rajitha Senaratne pays floral tribute to the late Prof. Senaka Bibile. Health Deputy Minister Fizal Kassim and others look on. Sri Lanka will produce drugs it needs next year. Several companies have signed 46 agreements with Sri Lanka to produce drugs and three of them have commenced production, Health Minister Dr. Rajitha Senaratne said. He was addressing the gathering at the Prof. Senaka Bibile Commemoration at the BMICH in Colombo on Monday. The Minister said that two more drug companies will commence production very soon. Five factories will commence next year. They will sell drugs at lower prices than controlled prices. Minister Senaratne said the factories will supply drugs for the State and the additional production will be released to the market. The drug importation will be decreased from next year. Prices of 13 drugs were slashed from September 1. Prices of 10 expensive cancer drugs and two medical devices including insulin prices were also reduced. A high number of people wait for eye lenses and the 100,000 eye lenses were imported to perform eye surgeries quickly. Reducing prices of drugs has not affected the availability of high quality drugs at the market, he said.